The first Kong appeared in 1933. King Kong, directed by Merian C. Cooper and Ernest B. Schoedsack, followed an adventurous filmmaker (Robert Armstrong) on a journey to Skull Island, an uncharted locale home to a legendary giant ape. The beast takes a liking to the director’s leading lady (Fay Wray), and is later captured and brought back to New York. Displayed in a Broadway theater, Kong breaks free and escapes, eventually climbing to the top of the Empire State Building where he’s shot and killed by swooping planes. The film was an immediate hit, and RKO Pictures rereleased it numerous times throughout the 1940s and ’50s. Roger Ebert called it, along with Citizen Kane, one of two “seminal” films of the early sound era, which “pointed the way toward the current era of special effects, science fiction, cataclysmic destruction, and nonstop shocks.” Its special effects, by Willis O’Brien, captivated generations of audiences and inspired scores of filmmakers. These were the early days of franchising in Hollywood, and Kong’s death at the end of the film posed a problem. The title of the sequel, released just nine months after the first movie, explains RKO’s solution: Son of Kong. On the run from the law, Armstrong’s character from the first movie heads out to sea yet again and eventually returns to Skull Island. There he encounters an albino gorilla he dubs “Little Kong.” The adorable critter befriends the humans but things still go to hell for the director (who really should try making romantic comedies or something, cause these expeditions are not working out for him). Son of Kong wasn’t nearly as successful as Dad of Son of Kong, and the franchise was left alone for a while. (Though there were numerous Kong imitators which we’ll get to in a bit.) Kong next appeared in Japan for a battle with the only giant monster to rival him for international popularity and name recognition: Godzilla. 1962’s King Kong vs. Godzilla was the Dawn of Justice of its day, an epic showdown between two marquee movie franchises. O’Brien had been working on a Kong sequel for years (including one concept that would have seen him face off with a giant version of Frankenstein’s Monster); the Japanese studio Toho eventually bought the rights to the material (without O’Brien’s permission, apparently) from an American producer. They swapped the second monster for their own Godzilla, and a classic showdown was born. Well, it was a classic on paper at least. Onscreen, this Kong (a man in a suit like Godzilla, rather than a stop-motion model like the original Kong) looked about as intimidating as Curious George. The story involved Godzilla’s umpteenth reawakening off the coast of Japan at the same time that Kong gets brought to Japan by a pharmaceutical company, who think he’ll be great for marketing purposes. (I guess if you scare the crap out of everyone by unleashing a giant ape on Tokyo and you can sell a ton of anti-anxiety meds.) King Kong vs. Godzilla is also the source of one of the most persistent urban legends in movie history. As the story goes, the film was released with two endings; one where Kong won (for American audiences) and one where Godzilla prevailed (for Japanese fans). Although the double ending became an accepted fact (I read it in a book about monster movies as a kid), it wasn’t true; the only ending of the movie featured Kong as the victor – or at least the only one to pop back up to the surface of the ocean after the two squared off. Kong returned for a second Japanese adventure some five years later in King Kong Escapes. In a classic kaiju twist, he faces off with a robotic Kong. Instead of the Empire State Building, there’s a kongfrontation on the Tokyo Tower. The big ape returned to the United States in 1976, when Dino De Laurentiis produced a new interpretation of the original film. Instead of a bunch of moviemakers, this Kong is found by an oil executive played by Charles Grodin and a primate scientist played by a hirstute Jeff Bridges. The movie won an Academy Award for visual effects; Kong was portrayed by a man in a suit created (and worn) by special effects makeup guru Rick Baker in collaboration with Carlo Rambaldi, who later went on to design the title character from E.T. On this trip to the Big Apple, Kong scaled the World Trade Center, which had recently been completed at the time of shooting. Old posters and the covers of early DVDs for the 1976 King Kong depicted the monster atop the Twin Towers, swatting at airplanes. After 9/11, the box art was understandably replaced. 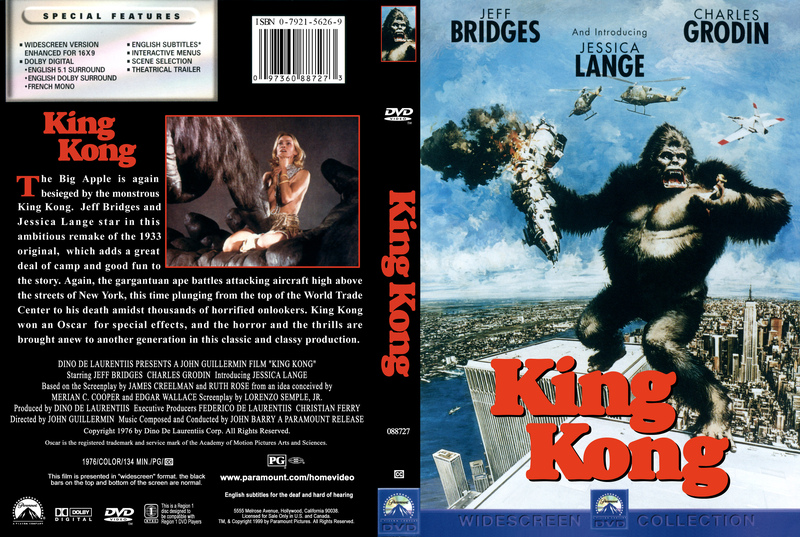 Kong survived his fall in 1976, at least once De Laurentiis put out a sequel called King Kong Lives a decade later. This time there were two Kongs, male and female; the latter is recruited to provide a blood transfusion for the former after his injuries in the first movie. Love and babies follow, along with a storyline that really calls the title into question. The trailer below repeatedly calls Kong “American’s biggest hero,” which is a charitable reading of the character’s onscreen activities up to that point. One of the stranger footnotes in the character’s history followed in 1998, when Warner Brothers released an animated musical version direct to video. The Mighty Kong featured the voices of Dudley Moore (in his final role) and Jodi Benson, better known as the voice of Ariel in The Little Mermaid, along with songs by the Sherman brothers, famous for their musical contributions to Mary Poppins and Chitty Chitty Bang Bang. Kong returned to the Empire State Building, and the past, for Peter Jackson’s King Kong in 2005. Jackson essentially remade Cooper’s Kong, setting the story back in 1933, when the original film was released, and only updating the special effects: His Kong was a motion-captured CGI bruiser performed by Andy Serkis. That was Kong’s last big-screen adventure for a dozen years, until this month’s Kong: Skull Island. Taking a page from Jackson’s interpretation, this is also a period piece, albeit one set in a different time period; this time Kong is discovered in the early 1970s. And taking a page from King Kong vs. Godzilla, this new film will set the stage for a future sequel where the two titans will square off. No word yet if different countries will get different endings. Just as Kong towers over a regular-sized monkey, the number of King Kong rip-offs dwarf the number of legitimate Kong movies. The most famous is probably Mighty Joe Young, which was produced by Cooper, directed by Schoedsack, with effects by O’Brien (and his assistant, a young Ray Harryhausen), and released in 1949 by original Kong distributor RKO Pictures. Once again, a gorilla from the wild is brought to the big city to become an showbiz attraction. Things go better for Joe than they did for Kong, at least for a little while, but the audience didn’t come to these movies to see the happy adventures of a cheerful gorilla. They came for the chaos. Joe’s reputation was good enough to earn him a 1998 remake, featuring the late Bill Paxton and a young Charlize Theron. Rick Baker helped create this Joe, a far more impressive animatronic gorilla costume than the one in the ’70s Kong. The King Kong title has such marquee value that many filmmakers have tried to exploit it over the years, changing it as slightly as possible for their own gain. There was the exploitation film King of Kong Island, which featured neither a Kong nor an island, the gender-flipped spoof Queen Kong, and Konga, a British ape picture starring Michael Gough. Everybody, gather ’round now, let your body feel the heat. Don’t you worry, if you can’t dance, Konga will trample you with his feet. The Shaw brothers made their own big ape movie around the same time as De Laurentiis’ Kong called The Mighty Peking Man. Forgotten for decades, it garnered more attention in the late ’90s when Quentin Tarantino rereleased (even into a few theaters!) as part of his short-lived Rolling Thunders Pictures distribution label. And there’s King Kung Fu. The title speaks for itself, but if you’ve ever wanted to see a guy in a gorilla suit spin kick dudes in the face, this is the place to do it. That sounds (and looks) pretty silly, but when you think of it, it’s not that much goofier than the original King Kong concept, where a giant gorilla lives on a secret island full of dinosaurs, and then falls in love with an actress. If Kong really is going to square off with Godzilla in a few years, he might want to brush up on his kung fu. He’s going to need every advantage he can get. Source: How Many ‘King Kong’ Movies Are There?